Patch testing is a form of allergy testing to detect a second form of allergy that is mediated by immune cells but not by antibodies like in previous tests. It takes several days for the immune cells to recognize and develop reactions to the allergens so when you have the test done, you will have a patch containing allergens of interest applied to your back for 48 hours. The reaction on the skin is read at 48 and 72 hours. 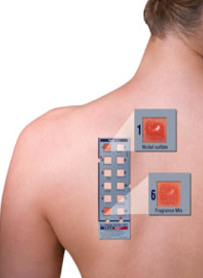 Patch test is used to help diagnose allergic contact dermatitis, certain types of food allergy and drug allergy. Many of the patch test are not standardized and required careful interpretation of the results. For more information, please come for a discussion on this topic.